Over the past few weeks I’ve been researching math activities that integrate multiple disciplines. After visiting a number of sites on Twitter, I found an interactive Google Map. 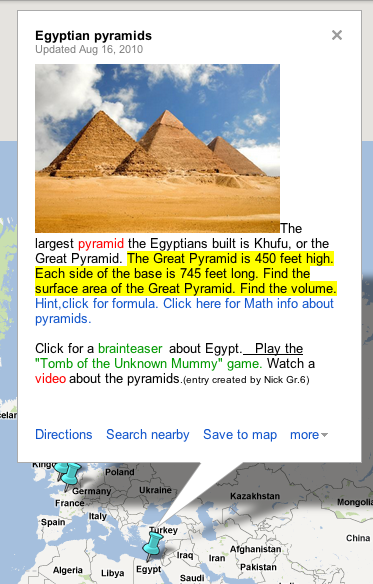 This activity took students to a Google Maps page that gave information about various landmarks around the world. Not only was there a social studies connection, but the majority of student work dealt with higher level math. There were links by the questions that gave students opportunities to learn more about the landmark. Logistically, I decided to group the students in 2 or 3 and gave one iPad/laptop to each group. The technology was needed to visit the site and find the information. Some of the questions were quite challenging for my students. I overheard one student saying that since they are already on the Internet they could look up the formula. They asked me and I told them that was fine. Part of this activity is exploration and finding the information for application on your own.